In my last post just before Christmas I mentioned that hopefully there would be another update before the end of the year, and so there is! This time I wanted to post an update on the progress on the model railway to date. Looking back through the blog I’ve been slightly shocked to see that the last time I posted about the design for the main layout was back in January! Work has started and stopped a number of times since then depending on time, however this autumn there has been real progress. After playing around with various model railway design software, I eventually purchased a license for AnyRail. I originally tried to work within the trail version and stitch the images together, however when I then wanted to change something fundamental then this didn’t work well. One thing I did discover is that there are different prices on the website for the different currencies (US Dollars, Euro, British Pounds plus others), however some of the conversions between then come out fairly interesting. The license is £35 to buy directly in pounds, however the Euro version post currency conversion works out about £28, even when allowing for the credit card non-pound transaction charge it came out cheaper. The top of the drawing is the fiddle yard, this will actually stretch under the station at the top left which is elevated relative to the rest of the layout – getting the levels right has been quite fun! On the right is the main country station with bay platform and head shunt (hope I’m using the term correctly). This needs to be long enough to take 4-5 carriage trains. The bottom of the drawing will be a viaduct across probably a canal in the bottom. 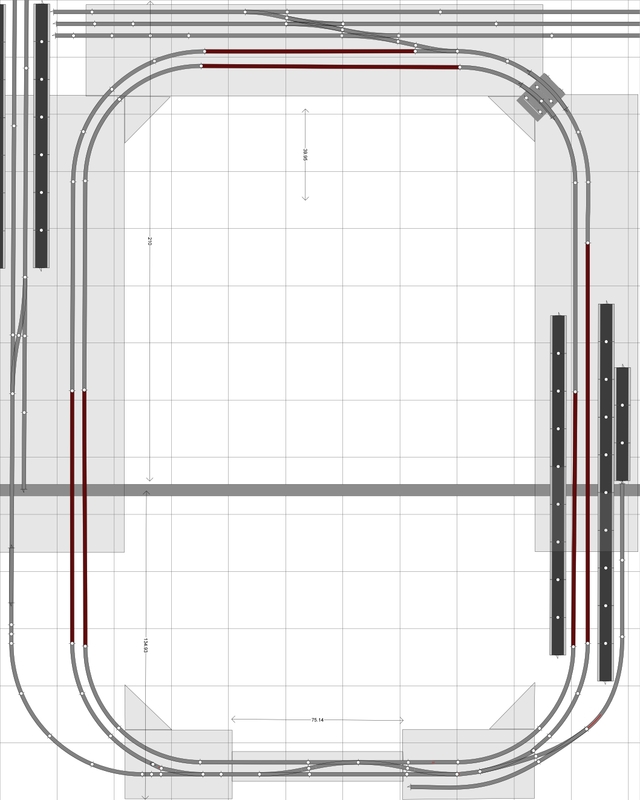 One of my main issues is that the main cross over logically sits on the main line between the two stations. This means that it’s directly over the viaduct bridge. This worries me for two reasons – firstly derailments and trains trying to fall off the bridge, and secondly hiding point motors under the track within the bridge. This is one of those things I’m going to have to look at during construction and see if I can push the pairs of points to either side of the bridge rather than onto it. If I can’t I might have to compromise and go for some side point motors, rather than underneath. Obviously there is going to be more changes and tweaks during construction, however I’m pretty happy with much of the basic building blocks here. Hopefully I’ll get a moment to post some work in progress photos on here shortly as the construction of the base board is well under way. This entry was posted in Model Railway and tagged 2015, AnyRail, Baseboard, Canal, Gradient, Layout design, Model Railway, Station, Viaduct by John. Bookmark the permalink.